Oh look! It's the 1000th topic! Do I get a prize or something? Anyway, the ZFP Stinger. Let's discuss please. EDIT: Whoa! 1000th topic denied! Well, at least that passport guy is gone! -Cost: 600 (6 SuperMelee points). -Attacks: Antimatter pellet spray, tongue lash. -Analysis: The Stinger is a cheap yet versatile vessel. Although it may lack the raw health and firepower of some more expensive ships, it is expendable and, in the right hands, still quite a formidable foe. It is maneuverable, but not overly fast. Its primary weapon is short-ranged and does relatively little direct damage. However, its rate-of-fire is high, and the fact that the pellets do not move uniformly is a great boon when fighting more mobile opponents, such as Skiffs or Furies. Its secondary attack is powerful but dangerous, both for the target and the Stinger itself. Although it only costs 7 energy to use, it deals quite a significant amount of damage, with the downside being the highly limited range. As such, it is to be used with care. If utilized properly, it can finish off a foe or deal significant damage, but it does risk the Stinger's continued existence. It is also worth noting that the tongue lash can stop Ur-Quan fusion blasts (and would therefore be able to stop any shot short of a fully charged projectile from the Trader-class vessel), although I have only successfully managed this once, owing to the impeccable timing and aim necessary to successfully block an incoming projectile with a mere tongue lash. Really, it surprised me as much as you when I managed it and my Stinger somehow didn't lose half its health. -Tactics: Planets are the keystone. Due to the Stinger's maneuverability and low inertia, it can easily take advantage of gravity wells to get within range quickly, whilst being under relatively little risk of crashing into the planet itself. A common tactic is to remain in orbit, constantly accelerating in a circle until the opponent is in a suitable position, at which point an attack can be launched. Preferably, this would be when the opponent are themselves entering the gravity well, at which point the Stinger has the advantage. Launching outwards to hit a foe outside the well is also a possible tactic, as the added speed of the gravity-assist will help the Stinger close the distance. However, once out of the gravity well, the Stinger is vulnerable. If it wishes to maintain speed, it cannot change course, which makes its path predictable. Furthermore, should it need to dodge, its limited speed will make retreat most advisable, as a Stinger is inefficient at attacking with its own speed alone. Most commonly, a retreat back to the gravity well would be advised, from where the previously described tactics can be repeated. Used properly, the Stinger may succeed in taking down even quite mighty foes, which can easily make it very cost-efficient in the right hands. I don't have much experience using the Stinger, so thanks Quasi for the informative analysis; I never knew the tongue attack could be used to intercept incoming projectiles! Precarious, yet possible! Speaking of tongue attacks <-- are there any ships that you feel are most vulnerable to an unrelenting tongue-lashing? The Troglodyte wrote: I don't have much experience using the Stinger, so thanks Quasi for the informative analysis; I never knew the tongue attack could be used to intercept incoming projectiles! Precarious, yet possible! Yeah, the Stinger is pretty much my go-to low-cost ship. It's not all that powerful, but it's cost-effective in the right hands, and that's good enough for me. Certainly beats the Drone, at any rate. Talking of tongue attacks... well, anything with a poor turn rate would work. Anything which gets too close deserves to get tongued - it's great if someone can't steer and flies right into you. More specifically, if I recall correctly the Tongue goes through the Terminator's and the Jugger's shields. Unfortunately, their firepower and turn rate make them rather hard to attack -as they will often just kill you before you manage to tongue them at all- but if you get in close, you can do good damage. The big 30-costers all have their own means of defense, so they are rather hard to attack in that respect. Never try to tongue an Avatar. That being said, the Blazer must -in blazer mode- get really close in order to attack, at which point you can tongue and do quite serious damage. The Podship is good if you manage to catch it from behind, but the homing nature of the plasmoids makes the tactic risky. Likewise, the Mauler is a good target except for the fact that its recoil is quite considerable, which means that it can accelerate backwards and return fire with a vengeance. It's a nasty trap which has eaten more than one of my Stingers in the past. Generally, however, the Stinger isn't a powerful vessel, possessing neither great speed, health or firepower - you need competent hands at the wheels -and a gravity well- in order to truly be effective against much of anything. Its greatest strength is, honestly, that of an expendable scout, or a soft counter to fast ships (thanks to the whole spray-fire thing) when you do not have an Avatar on hand. It makes for a great opening ship. It's powerful enough to be able to fight against weak ships without having to resort to the Scout's suicide attacks, and yet cheap enough so that if you lose it, oh well, it's only six points. Besides, you can still do some damage, and for six points, you do not need to deal that much in order to get your points' worth. I never hit anything with the tongue. It goes through shields too? Wow, I never knew that either, but you're right, it's not as if you can exploit that capability to gain any advantage since you'd be running right into a buzzsaw! Since you mentioned the Avatar, can you a ZapSat? I am also terrible at hitting stuff with the tongue, and as a consequence, never liked the ship very much. The "spray and pray" main gun is decent for a cheapo ship, but it takes some serious practice with the tongue to get the timing just right to do damage with it: too early, and you're left wide open, too late and you bump the enemy ship away and are also left wide open. The not insignificant delay between uses means that sticking around to try to hit something more than once is also inadvisable in many cases, but the retreat can often get the Stinger destroyed anyway. As has been said, its biggest strength is probably the fact that it's only 6 points, and thus good for scouting in Supermelee. These probably do not deserve one (or more) of the limited berths on your flagship in story mode, especially if you intend to continue a no-crew-deaths run. The Troglodyte wrote: It goes through shields too? Wow, I never knew that either, but you're right, it's not as if you can exploit that capability to gain any advantage since you'd be running right into a buzzsaw! You can tongue a ZapSat, yes. Assuming you don't get fried before getting within reach. In the best case, you'll kill a ZapSat and die in the process (or have about two health, as long as we're assuming that the main ship doesn't shoot at you and the other ZapSats are still alive), which is still quite bad. Also, I wouldn't advise you to attempt tongueing plasmoids. The tongue-attack has some... funny interaction with the way plasmoids handle taking damage. Long story short, the tongue hits, the plasmoids starts to expand as it takes damage... and since you are so close in order to tongue, it hits you before it can be reduced to nothingness, which hurts. A lot, considering your limited health. As for everyone who isn't hitting with the tongue, my only advice is practice. It's sort of like learning when to bring up your shields with the Jugger/Terminator or learning exactly when to press teleport with the Skiff (which can get quite funny once you start to reliably dodge Glory Device detonations). Just train, and you'll get it right sooner or later. Well, as most of you are probably grown accustomed, I’m going to be testing our little unusual friends by putting them through the ringer, in the form of fleet versus fleet action, and hopefully I’ll be able to find little insights and learn how the AI operates to make sure that I do the complete opposite, guaranteeing my success! ZFP wins with 1 remaining Stinger! ANALYSIS: I think they found their ominous signals! It's actually a darn shame that the Umgah Drone got any kills whatsoever, let alone 13 bogey splashes of our ZFP buddies, but that's the way it goes when all of the Stingers are being flown by a computer that thinks it's okay to casually fly through an Antimatter Cone every now and then -- It's almost as if the ZFP felt sorry for the blob guys and decided they would take turns winning and losing; the match was very back and forth with this unusual theme. 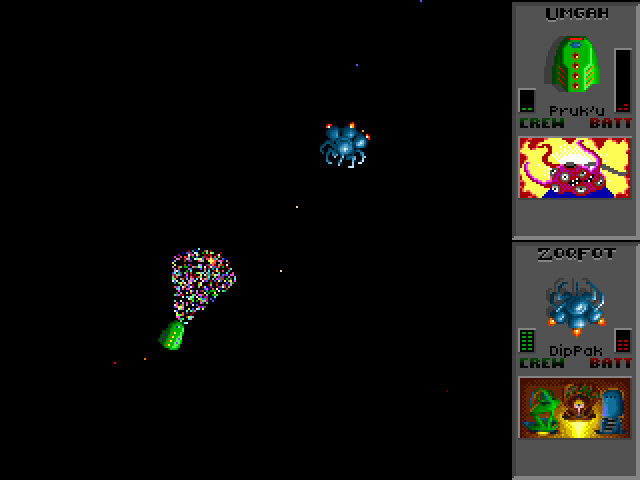 However, the few times when the ZFP were patient, they could stay well out of reach of the Umgah's cone and fire their own version of antimatter, but instead in the form of a sporatic spray of antimatter shards, some of which, due to their unpredictable movement in flight, could sometimes veer around the front side of the cone shield and suddenly shift, hitting their target on the Drone's unprotected side. Many times, a Stinger would work extra hard to whittle down the blobs into space puddles, only to quickly find itself inside a kaleidoscope of death after the emerging Drone would use its reverse thrusters to zip across space and position itself for an ideal attack to the unwary Stinger, which would often times unleash a panicked Tongue Attack in desperation. Speaking of which though, there was a comical moment when an Umgah found itself caught for a moment in the planet's gravity, and the Stinger swept in and finished it off with a successful tongue attack! We were just talking about that! But boy!... It was a beautiful sight to behold!! I always preferred the Supox Blade. But it's already 16 points, nearly triple of a Stinger. And when fling backward you need perfect timing to be able to turn and keep your backward flying, otherwise your ship starts flying forward into the antimatter pellet spray / antimatter cone / ZapSat. The Blade in human hands is the perfect small ship against the Cyborg Avatar.